Hi everyone! 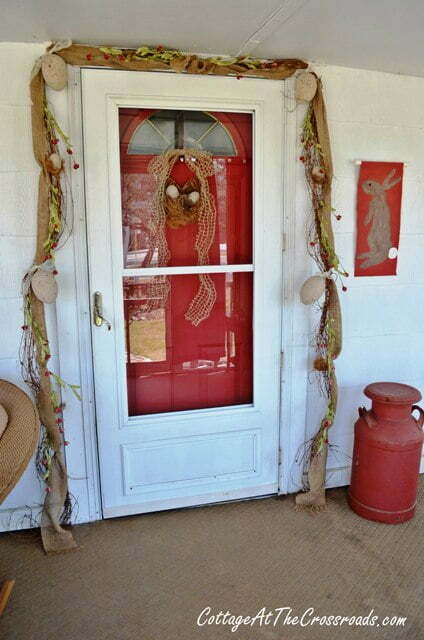 I thought I’d show you how I’ve decorated our front porch for Easter. 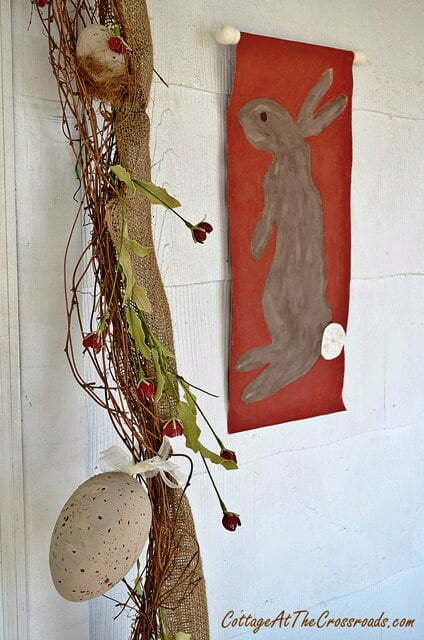 I was inspired to paint some bunnies and eggs after seeing a bunny wall hanging in the Pottery Barn catalog. While red is not a traditional color for Easter, I had to work with the colors that we use on the front porch. 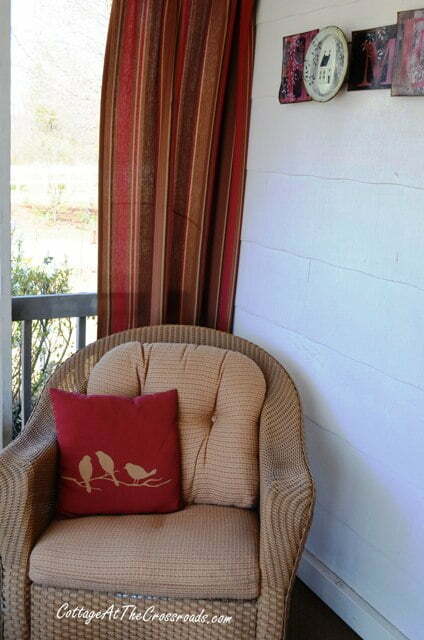 Pastel colors just would not have looked good with all the red, brown and tan colors we have on the porch. 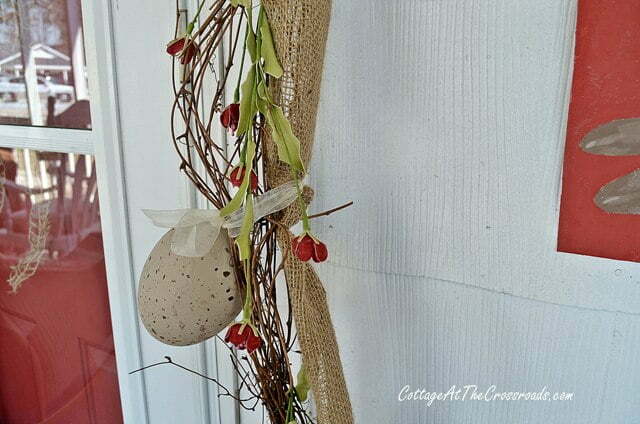 And since I already had the grapevine and burlap garland hanging around the door, I decided to add some flowers and natural colored eggs to it. 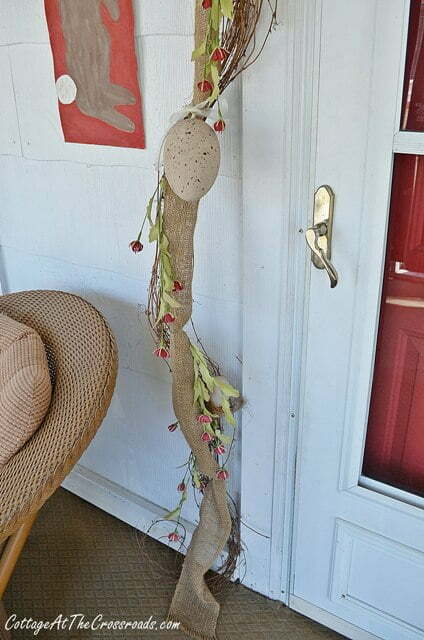 I used the same garland in decorating the porch for Christmas. Here’s a closeup where you can see the painted bunny and garland on the left side. And here’s the right side of the door. 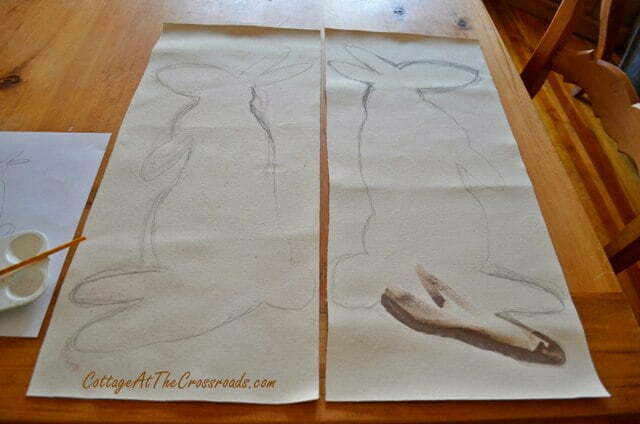 To make the two bunny wall hangings, I cut a piece of canvas in half and rough sketched the bunnies. 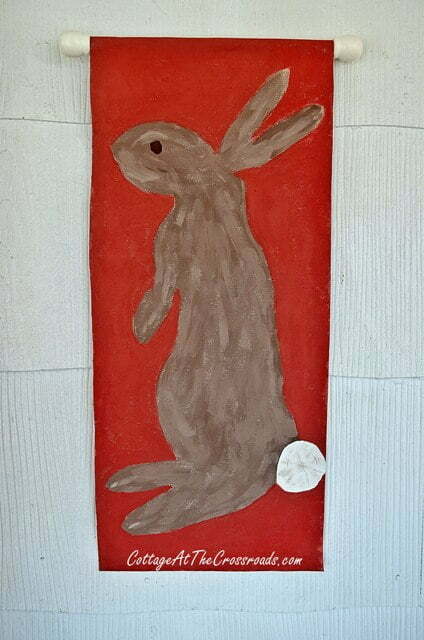 Then I painted the bunnies brown with some craft paint. I painted the red background using the leftover paint that I had used to paint the table on the front porch. Then I asked Leo to cut 2 dowels the right size. I already had the little end caps for the dowels. So up on the wall they went! 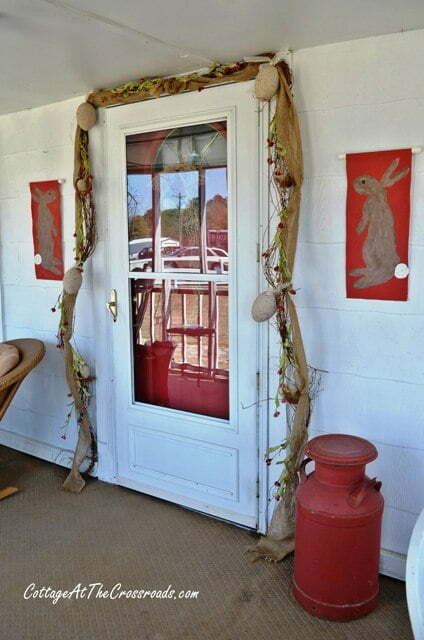 It’s really hard to get a photo of the front door without a reflection, but I wanted you to see the garland and the bunnies together. There are some large eggs tied onto the garland. And there are some smaller ones tucked into the grapevine and in this basket that’s hanging on the door. Would you believe that these eggs started out as bright, plastic Easter eggs? 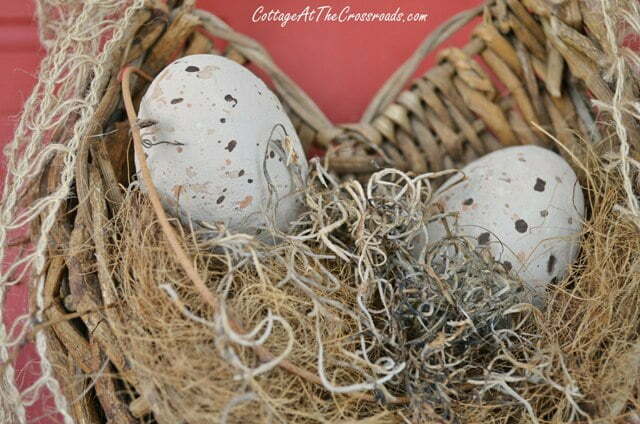 If you want to know how I painted these eggs, you can check out my guest post on Debbiedoo’s blog how to paint cheap, plastic Easter eggs. Here you can see the simple door decoration that has 2 of the painted eggs in it. 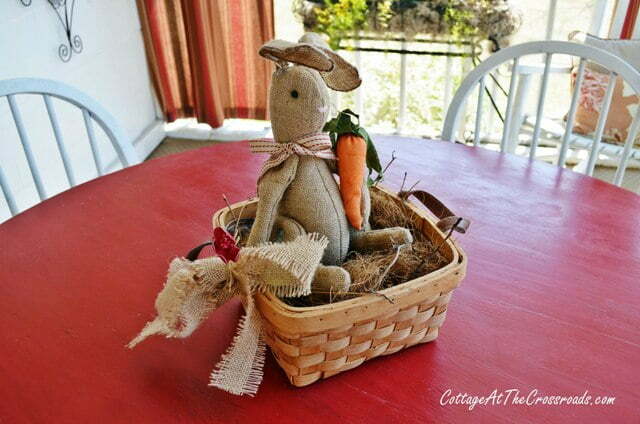 On the table, I placed a little burlap bunny in a basket. 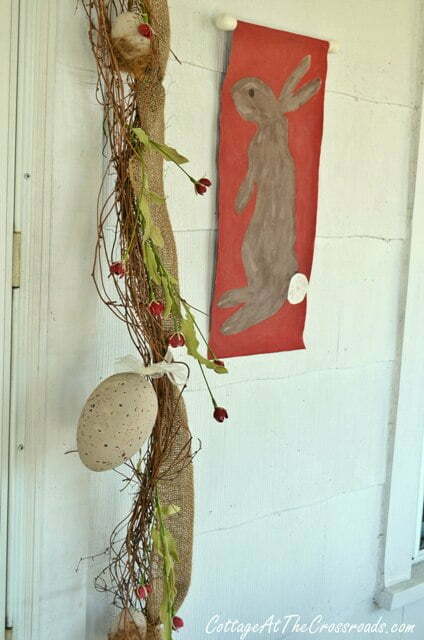 I love how the garland with the painted eggs turned out. The natural colors just suit our front porch on our little cottage. Now if only the weather would warm up so that we can enjoy these bunnies and eggs! Jane, your porch looks wonderful! The colors may not be the pastels we see so often, but change can sometimes be like a breath of fresh air. When you think about it, Easter represents that time of year when we celebrate the fact that Jesus died for us to be covered and saved by the sacrifice he gave in shedding his blood. Considering this aspect, the color red would certainly be appropriate, if not necessarily typical. By the way, I love the rustic and folksy look of the decorations, especially those cut bunnies! Way too cute Jane…I love these eggs and so did many others. You have a magnificent Spring porch hoppining this year. This looks great! You made it look so inviting:) I love the painting! Hi Jane~ I just saw your tutorial for your eggs! Love their natural color! Love the way you decorated the eggs. They look so good in you garland over the door. I have some paper mache ones I need to do this treatment to. Thanks for sharing. Hi. I saw your spray painted eggs over at Debbie doos. Great idea that I will employ this week! Granddaughter arrives in a week & I am all about getting ready. I am an folk artist & learned to splatter paint with a loaded toothbrush, too. But to load it lightly and use the index finger like a rack across the top. You get spatters this way but fewer glops 🙂 . Hope this helps. Now that I’m here I plan to have a look around your 100 yr old family homestead! I love your porch- the painted bunnies, the garland, and all the red! (my favorite color, it makes me happy) 🙂 Looks like a lovely place to sit and relax. 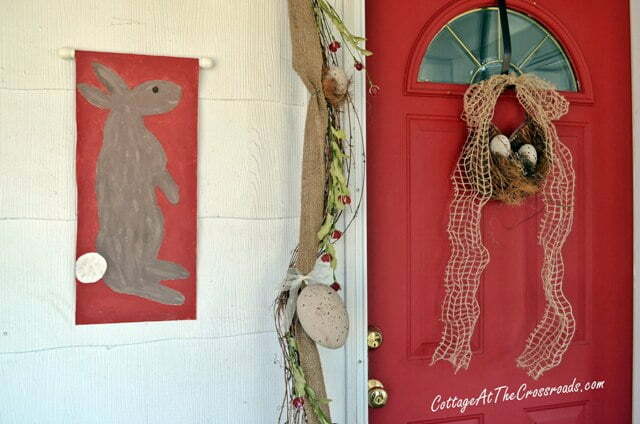 Such a welcoming front porch – love those bunnies!! And isn’t it amazing what a makeover can do to a plastic egg! Hi, Jane! 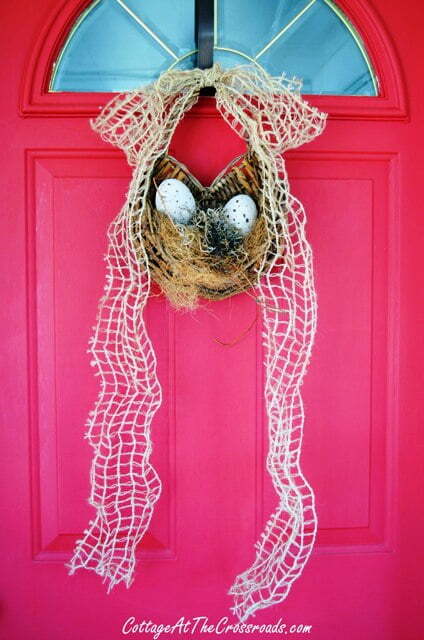 I love, love your front porch decor! Everything looks so pretty and welcoming. I have a new link party and I would love if you come over and link up your beautiful porch. The link will be live tonight at 8:00pm Central time. Hope to see you there! You made it all work and I think the red is perfect. 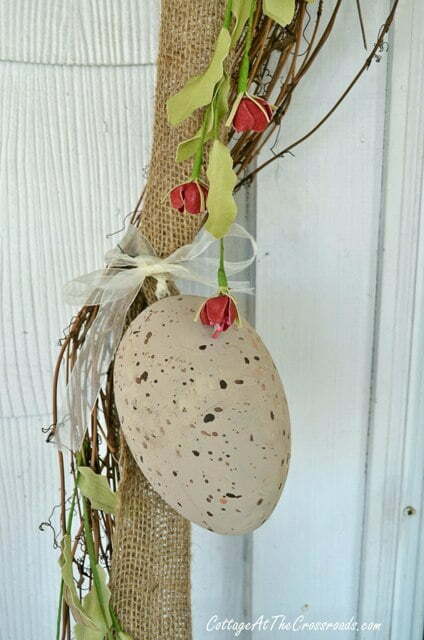 Those giant eggs on the garland are so cool! I’m impressed with the bunnies that you painted. You should do more of that…what a personal touch! sweet little hanging pendants Jane. I saw these in the catalog too but have yet to buy or to make. Hope all is well with you and Leo! Have a wonderful week Jane and Leo!! Love that garland around the door. Your bunnies are adorable!! I think I’m gonna have to paint some bunnies for my sunroom!!! I love it and the colors are perfect. You two are such a great team together. I can’t believe your drawing skills for the bunnies. Lovely! How cute! I love the burlap-and the red is perfect with it. I just pulled out the Easter stuff today,gotta get busy. 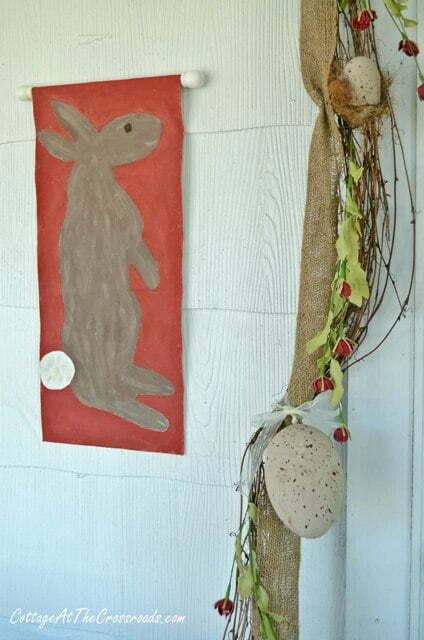 Charming folk art bunny banners. 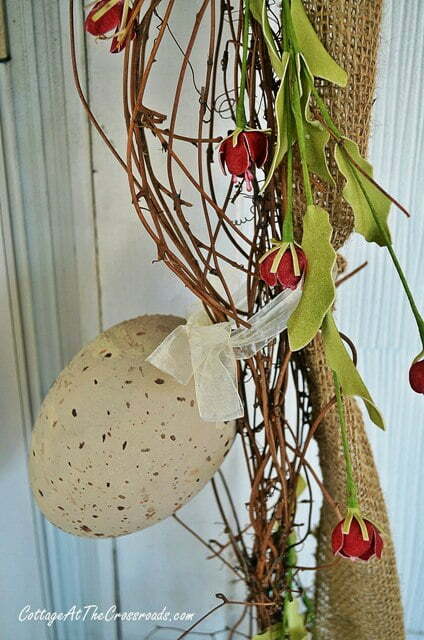 Love the egg garland around the door too, Jane. Cute as can be! You are very talented ~ the bunnies are adorable. I love the bunny panels you painted Jane. You worked with your red really well. Absolutely adorable and so welcoming! Jane, this is just too too cute! I love the bunnies on the red background. I didn’t know you were so artistic. I loved it is so pretty so my style! Thanks for sharing!